The Energy Department’s National Nuclear Security Administration has released a draft request for proposals for a contract to manage and operate the Los Alamos National Laboratory in New Mexico. DOE issued the draft RFP for the LANL management and operation contract competition through a FedBizOpps notice published Thursday. The contract’s scope of work covers research and development support to ensure the safety of nuclear explosive operations, engineering and scientific capabilities to support the evaluation and refurbishment of nuclear weapons stockpile at several sites and secure disposition and handling of plutonium, tritium and uranium, according to the statement of work. Potential contractors would be required to deter the proliferation of weapons of mass destruction, carry out nuclear energy R&D activities in support of other DOE initiatives, remediate the LANL site as well as conduct strategic partnership and technology transfer programs. Other requirements include the development of a quality assurance program and certified value management platform for program operations as well as technical depth to oversee activities throughout the program’s lifecycle. LANL is a federally funded research and development center that conducts research in the areas of national security, renewable energy, nanotechnology, space exploration, medicine and supercomputing with a primary mission to design, certify and assess nuclear weapons. NNSA will accept feedback on the draft RFP through July 26. 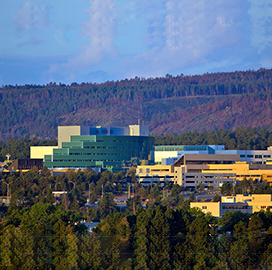 Los Alamos National Security has managed and operated the LANL facility since June 2006 through a contract with NNSA. LANS is a joint venture of AECOM’s (NYSE: ACM) URS subsidiary, Bechtel, BWXT Government Group and the University of California.